Forest Sangha - Portal for monastic communities inthe forest tradition. Forest Sangha Newsletter - in English. Amaravati Buddhist Monastery - English monastery in the forest tradition. Abhayagiri Monastery - Californian monastery in the forest tradition. Aruna Ratanagiri - English monastery in the forest tradition. Santacittarama - Italian monastery in the forest tradition. Dhammapala - Swiss monastery in the forest tradition. Santi Forest Monastery - Australian monastery in the forest tradition. Bodhinyanarama - New Zealand monastery in the forest tradition. Wat Pah Nanachat - The International Forest Monastery in Thailand, for English-speaking people. Birken Forest Monastery - Canadian monastery in the forest tradition. BuddhaNet - Buddhist information and education network about all kinds of Buddhism. Sadhu! 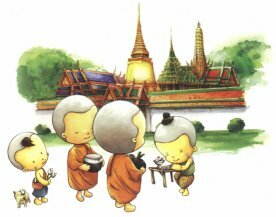 - Theravadan Buddhism web directory and portal.